“The much needed justice reform in Albania has once again come under attack. We call on all parties to complete the formation of the vetting institutions. “Attacking the judicial reform rather than ensuring implementation of vetting, with close monitoring of the International Monitoring Operation, harms Albania's present and future,” the statements reads. “Citizens deserve responsible leadership. We once again urge all political leaders to act responsibly, with respect for institutions, and pave the way for democratic elections, in line with international standards,” Mogherini and Hahn wrote. Mladen Grujicic, the first Serb mayor of Srebrenica, said in an interview on N1 television that he does not accept that genocide was committed in the town. “Each victim has its [own] weight and importance and this must be respected. But I can't agree with the qualification of the crime,” Grujicic was quoted by N1 as saying. He stated that in international court rulings, the number of victims of the Srebrenica massacre, when thousands of Bosniak men and boys were killed by Bosnian Serb forces in July 1995, is inconsistent. He added that he himself was involved in research into the crime, and claimed that he had come across evidence that some of the people who are recorded as being buried in the village of Potocari, where the Srebrenica memorial is located, are actually alive. Bulgaria’s leading party, the centre-right GERB, which won the snap parliamentary vote on March 26, and the nationalistic coalition United Patriots - who finished third at the election - have fully agreed on a political program for their future coalition government, leaders of the two political formations announced on Thursday. The program document, which outlines the common policies of the upcoming cabinet, is 21 pages long, a symbolic reference to its commitment to rule the country for a full four-year mandate until 2021, Valeri Simeonov, leader of the National Front for Salvation of Bulgaria - part of the United Patriots - told journalists. 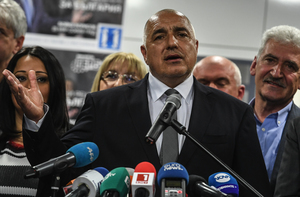 According to GERB’s leader, Boyko Borissov, the agreement has been reached as a result of over a week of hard negotiations, where both parties have made significant compromises. He said that the ministerial posts in the cabinet he will lead will be determined after the Easter holidays. The program will be published later on Thursday. The process of selecting Albania’s next president will start on April 19 and could last up to five weeks, the chairman of the parliament, Ilir Meta, announced on Thursday. In coming days, the parties will present their candidates, but it is not known whether the opposition will take part, as it has been boycotting parliament since February 18, asking for the government to step down and for an interim one to be brought in while free and fair elections are organised. 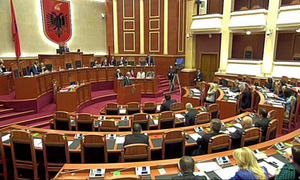 Under Albania’s constitutional changes in 2008, groups made up of at least 20 MPs have the right nominate a presidential candidate to parliament, which is then tasked with selecting the winner in a secret vote among the 140 deputies. The Slovenian government approved the proposal of the law for the protection of companies of systematic significance for the economy, made for the sake of its biggest retailer, Mercator. The law is similar to that passed by the Croatian parliament last week - nicknamed "Lex Agrokor" by the media because of the troubled Croatian private company it was allegedly created for - and was passed in order to prevent Agrokor from using Mercator's financial assets, as their biggest owner. The U.S.’s decision to green-light Montenegro’s application to join NATO was “deeply mistaken” and would create further division in Europe, the Russian foreign ministry said Thursday, AFP reported. “We consider the course towards including Montenegro in NATO is deeply erroneous, goes fundamentally against the interests of people in this country and harms stability in the Balkans and in Europe as a whole,” it said in a statement. U.S. President Donald Trump signed off on Montenegro’s accession to the military alliance on Tuesday. 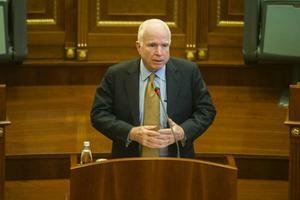 US Senator John McCain expressed his country’s support for the Belgrade-Pristina dialogue on Thursday during his visit to Kosovo’s capital. He also said that Kosovo should pass the border demarcation deal with Montenegro, and should only transform the Kosovo Security Forces into a regular army through constitutional changes and with support of the Serb minority. 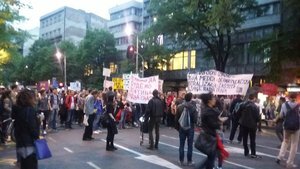 Hundreds of people gathered in the capital of Belgrade and northern city of Novi Sad in fresh anti-government rallies. 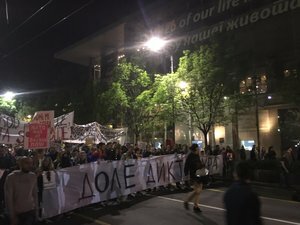 Today’s protests gathered fewer people, as it was previously announced that the rally would not be held due Easter holidays. According to the previous announcements, protesters will no be hitting the streets in the next four days, but the rallies will continue on Tuesday. Autonomija Info reports that protesters in Serbian second city of Novi Sad said they have been followed and filmed during the last several days. 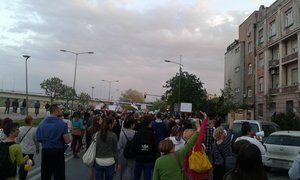 About 60 people, mainly youth and parents with children, gathered on protest in central Serbian town of Krusevac chanting “Down with the Dictatorship!” and “Everyone to the Streets!”. The protesters stated they will continue protesting during Easter holidays.